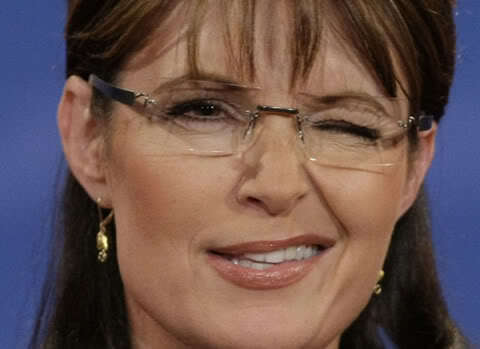 WINNER OF THE WANKER GIRL OF THE WEST TROPHY – SARAH (BRIDE TO NOWHERE) PALIN! This is strictly an editorial piece tonight. But then again, aren’t they all. The latest outrage spilling forth from the loose lips of “Sister Sarah” is that Canadians should abandon their universal health care system. After all there’s nothing that “common sense conservatism” can’t make even better! I don’t know about you but if there is a God in heaven then maybe just as happened in the Biblical account of Sodom & Gomorrah blindness would ensue to anyone caught looking in the direction of such an abomination! Even Glenn Beck characterizes her as “yappin’ in the kitchen” when asked if he would run on a Palin-Beck 2012 Presidential ticket. It should be noted that his demand would be for a Beck-Palin ticket, instead! By the way, Beck is reputedly a former shock jock (radio). Me thinks more of a “schlock” jock – with the strap two strands away from unraveling. But, you say, doesn’t she have a best-seller on the New York Times Best Seller List, “Going Rogue” (or more accurately – “Going Rouge”). In any event it should be pointed out that in a great many instances the honor of having one’s book rated a New York Times best seller is in large part due to it being bought up in great quantities by the WHOLESALERS – and NOT the final recipient – the actual CONSUMER. That is precisely what is happening to Ms. Palin’s “Going Rogue” so-called best seller. And at $4.99 to boot! Wow, some best-seller! In the final analysis, the Lady is a Tramp. She’s nothing more than poor white trash from Alaska trying to be the Britney Spears of politics. At least Britney was made to undergo rehab. Maybe they could make a sequel to “Fargo” and call it “Cargo Leaving Fargo”. ← VIDEO – SARAH PALIN “STIFFS” FANS AT INDIANA BOOK SIGNING – SHOUTS OF “QUITTING ON THE JOB” – SOUND FAMILIAR ?? ?